A preoperative assessment of the patient must elicit a personal and family anesthetic history. However, a previous uneventful anesthesia does not preclude malignant hyperthermia as many malignant-hyperthermia-susceptible probands sustain an untoward reaction during subsequent administration of anesthesia. 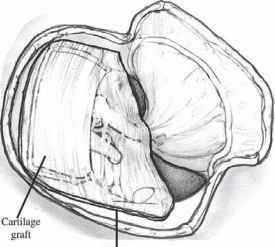 A history of unexplained cardiac arrest during general anesthesia in the family may be significant, and attempts should be made to establish the exact etiology. If malignant hyperthermia cannot be eliminated, the patient should be managed as potentially susceptible to malignant hyperthermia. A previous history of unexpected postoperative renal failure also suggests malignant hyperthermia. A history of postoperative pyrexia without an eventful intraoperative course is unlikely to be associated with susceptibility to malignant hyperthermia. The only disorder clearly associated with malignant hyperthermia is central core disease. As this association is variable ( H.a|s.§ll etal 1996), such patients should be treated as potentially susceptible to malignant hyperthermia and offered screening. A flowchart for preoperative management is shown in Fig 1. Fig. 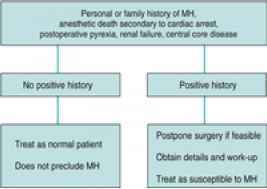 1 Preoperative management of malignant hyperthermia (MH).